Porsche will launch a hybrid version of its four-door Panamera saloon in June 2011. Priced from £86,146, the newcomer develops 380bhp and has a 0-62mph time of 6.0 seconds and yet thanks to the hybrid technology the Panamera S Hybrid emits 159g/km of CO2 with claimed economy of 41.5mpg. These figures make the Panamera one of the most relatively efficient luxury saloons given its performance and are down to a a variety of technical changes under the skin plus the use of lower rolling resistance tyres specially-developed by Michelin. The Panamera S Hybrid can run in purely electric mode for approximately 1.25 miles at up to 53 mph, depending on the road and traffic conditions. The Porsche hybrid drive is also the only system in the world able to exploit additional consumption reserves thanks to its so-called ‘sailing' function. When no power is required from the combustion engine, ‘sailing' entails switching off the engine and disengaging the drivetrain at speeds of up to 103 mph. The Panamera S Hybrid is driven by the same engine combination used in the Cayenne S Hybrid, a model which already accounts for a fifth of Cayenne sales in the UK. The main power is provided by a supercharged 3.0-litre V6 engine delivering 333bhp along with a 47bhp electric motor. Both power units are capable of powering the Panamera S Hybrid either alone or in combination. The electric motor also operates as a generator and a starter. The electric motor is connected to a nickel metal hydride (NiMh) battery where the electrical energy recovered while braking and driving is stored. Power transmission is handled by an eight-speed Tiptronic S, with a wide spread of ratios, as already fitted to the Cayenne. Every Panamera has a high level of standard specification that includes leather interior, Porsche Active Suspension Management (PASM), xenon headlights, front and rear ParkAssist, tyre pressure monitoring, an automatic dimming rear view mirrors, Porsche Communication Management with touch-screen satellite navigation and audio controls, cruise control and a three year warranty. The Panamera S Hybrid also features adaptive air suspension as standard, plus the innovative display panel - already seen in the Cayenne Hybrid - that provides the driver with all the relevant information about the vehicle's specific hybrid driving status. 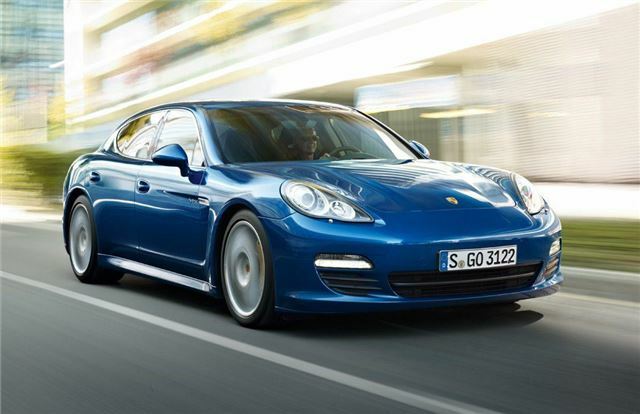 The Panamera S Hybrid goes on sale in the UK in June 2011, priced from £86,146. The low emissions of 159g/km CO2 is of particular relevance to fleet and company car buyers as it sits under the Company Write Down Allowance threshold of 160g/km. This means for a company purchase, the price can be offset against tax at the rate of 20% per annum. Fitted to every Panamera is a Porsche Vehicle Tracking System (VTS), a sophisticated vehicle security package approved to Thatcham Category 5 standard, and customers will also be able to explore the potential of their new car by participating in a complimentary course at the Porsche Experience Centre, Silverstone.